Romans 7 offers one of the deepest and richest teaching on sin, and in my opinion as great a writer as Paul may be, this passage on sin is one of the most confusing pieces of text, both in syntax and in semiotics. It may not be as abstract as the prophecies of the Old Testament prophets, or as difficult to understand as the End Time Prophecies, but it is confusing, and Romans 7:15-19 especially reads like a tongue-twisting riddle. I don’t aspire to decode this riddle in terms of semiotics – if you truly want to understand this passage, it’s best if you refer to proper pastors and teachers – John Piper alone took 6 sermons to explain this passage, and even so he didn’t exhaust everything. My focus here is to tackle the syntax of the verse; and attempt to draw connections to the rest of the Bible in terms of semiotics – but I won’t be decoding the riddle. I probably still don’t understand this big concept much myself – it’s like I’ve heard the answer to this riddle, but I don’t quite get the joke that makes the riddle work. I – Let’s first get this out of the way, who is ‘I‘? Of course we know that Paul is speaking here, and that this ‘I‘ would naturally refer to Paul. But was he merely referring to himself? Or could he be also referring to himself as a representative of Christians or even mankind in general? If he had been referring to himself, was he referring to the him before conversion, or the christian him? It would make sense if a non-christian him, who was then still known as Saul and an enemy of the church, does not understand his own actions. It would also make sense if it was the newly converted him, who was still feared by the christians and guarded against. Yet there is nothing in the passage to hint towards a need to refer to a Paul of the past. He wasn’t speaking to new Christians. He wasn’t speaking about non-believers. He was speaking to the Romans in general, to Christians in general, many of whom are possibly already mature in their faith. do not understand what I do – He doesn’t understand his own actions. He doesn’t understand why he does certain things. He doesn’t understand why is it that his actions are heading the opposite path from his heart. Who can understand the human heart [Jer 17:9|Article]? No, not even ourselves. You may desire strongly for something and yet find yourself doing the exact opposite. Why? – I’m a human, and I too do not understand the human heart. I wish I can tell you why. Paul lumps it on sin – the natural, universal sin that is in everyone of us. Because sin is in us, we are sinful, and because we are sinful, our hearts are messy, and we cannot escape from sin. For what I want to do I do not do – What exactly is Paul referring to? What did he want to do, and yet not do? We find the answer a few verses down – For what I do is not the good I want to do; no, the evil I do not want to do–this I keep on doing [Romans 7:19] – perhaps the one representative verse of this whole discussion on sin. Paul wants to do good. We want to do good – to varying extents perhaps – but who doesn’t want to be good and do good if not for all the obstacles and all the temptations? As Christians, we know what we ought to do. We know, and we do genuinely want to do good. We want to do God’s work.. We want to behave as the Bible instructed us to. Yet, it is easy not to do. The sin of omission is when you miss an opportunity to do good – and it’s hard to notice, because it’s often under the radar. 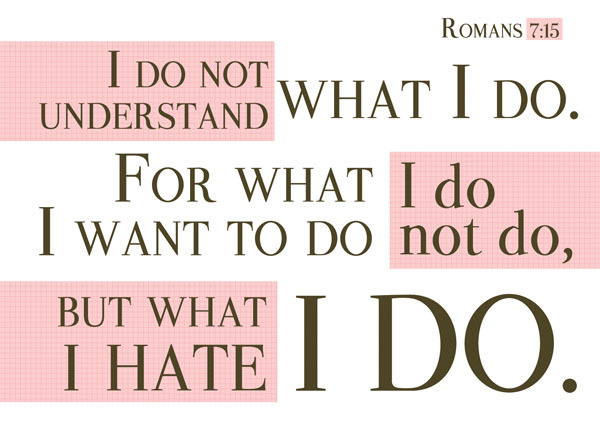 but what I hate I do – Referring to verse 19 again – yet the evil I do not want to do – this I keep on doing [Romans 7:19]. Paul was a very unique apostle and a very outstanding Christian, but even Paul isn’t without sin. Even Paul isn’t without temptations. But because he is god-centered, he hates what he does – he hates the things he did and will do that are not beneficial for the church and for the kingdom of God. How many of us truly hate the sins that we commit, or the redundant things that we indulge in? How many of us truly hate the sinful parts of ourselves and the sinful acts that we commit? If we truly do hate the sins that we do, and if we are truly frustrated about being unable to do the good things that we want to do – this life could be extremely suffocating. Paul gives us an escape route from self-persecution. We will always sin. The extent may vary, the regularity may vary, the consequences may vary, but no man is without sin – all men who were claimed to be righteous are righteous not by works, but by faith. We who are called as righteous are only righteous by faith, and never by works. If we spend everyday hating ourselves and praying forgiveness for all our past sins – we will lose the chance for our faith to grow. Not that we shouldn’t repent and ask for forgiveness, not that just because there is natural, inherited sin means that we have an excuse to sin – but really, isn’t this entire passage a show of God’s grace to us? We are no longer bound to the law that condemns us sin by sin. It is typical for a Christian to want to do what is right. But it takes a person who truly seeks God’s heart to be able to hate what is evil. If you truly love God, and you find yourself falling short of his standards, you will be disappointed. You will be frustrated. You will be upset with yourself. Paul cuts himself no slack by calling himself a wretched man [Romans 7:24]. But he also tells us that he has been saved from the body of death by God. There is hope. For sin shall not be your master, because you are not under law, but under grace [Romans 6:14]. Let us not persecute ourselves for our past deeds. Let us not persecute ourselves for deeds yet done. Be aware of this universal sin; be aware and be wary of it lest it becomes an excuse for us to sin. Never assume you understand what you’re doing. More often than not, we probably don’t until it’s too late. May I use the image you posted and credit you on my blog? I wrote a poem that references Romans 7 and thought this image would go very nicely with it. Thank you. Please go ahead ^^ I don’t need any credit. Feel free to use any images of mine. Thanks for asking though, I appreciate it! Will check out your poem soon!